As one of the leading Nelson Bay resorts, The Landmark, Nelson Bay apartments feature self contained studio, one and two bedroom units that flow out onto external balconies. Nelson Bay holidays all have rooms with reverse cycle air conditioning in the lounge area, kitchenette with dishwasher and microwave, DVD player, hair dryer and cable TV. We believe it is our superb service combined with our exceptional facilities and ideal location that makes us one of the most sought after Port Stephens resorts for all kinds of travellers. Please be advised there will be ongoing room refurbishments for the majority of 2019. General hours of work are from 09:00 until 17:00 daily. Some noise is expected from 08:30 each day due to the use of power tools and machinery. For further information please contact the property in advance. 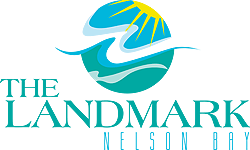 The Landmark Nelson Bay is well located right in the heart of Nelson Bay and has an array of facilities both on-site and nearby to keep everyone entertained.